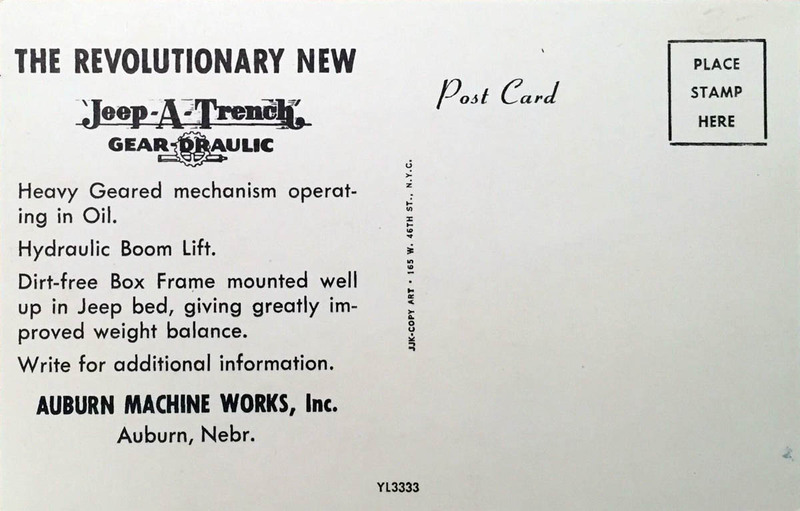 Auburn Machine Works Inc. in Auburn, Nebraska must have been pretty proud of their latest Jeep-A-Trench model when they had it photographed in front of their plant for this colorful advertising postcard (see the back, 100K JPEG). It's mounted on a shiny new late-1950s CJ-3B. The Jeep-A-Trench trenching attachment seen above was indeed a significantly improved model, compared with the earlier version seen in the postcard at right, on a CJ-3A. The boom is in digging position, with the the augers moving loose soil away from the trench. The early Jeep-A-Trench was attached to the back of the Jeep, while the new "Gear-Draulic" model had much of its weight inside the body, an obvious advantage. Power for the new model actually came from the front PTO rather than the rear. 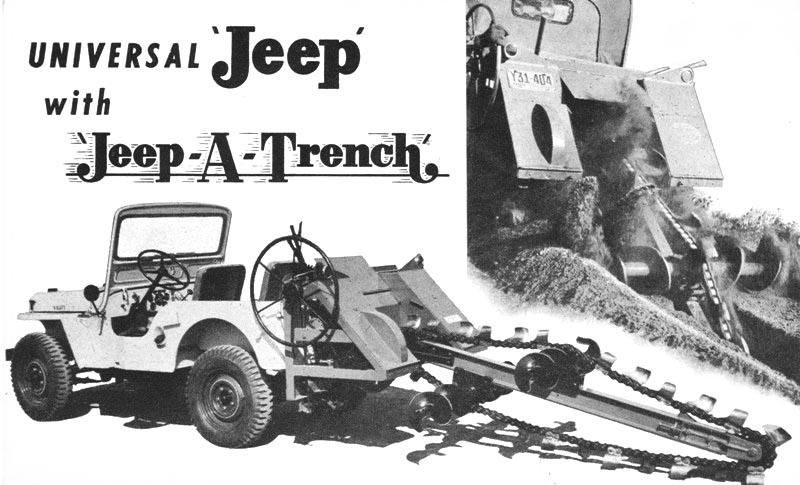 "An accomplishment in design permits the installation of the new Jeep-A-Trench Gear-Draulic well forward in the Jeep body over the frame. Moving the center of gravity ahead places more weight on the front wheels, making for more stability and better traction for straighter trenches, and greatly improves steering and roadability between jobs. Being designed, engineered and manufactured in our own plant assures the purchaser uninterrupted parts service." "Our own specially designed speed reducer has a nickel bronze gear and ground steel worm mounted on anti-friction bearings in an oil tight case, and is driven by the variable speed hydraulic drive." 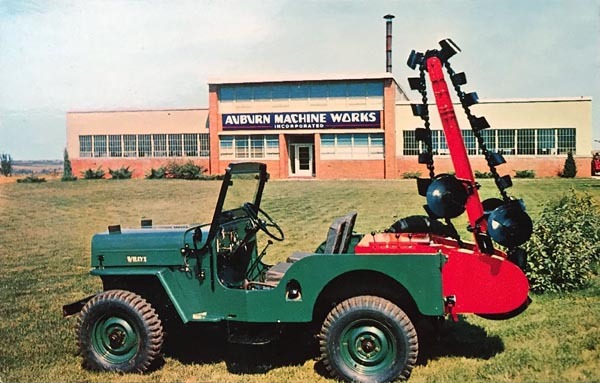 "The engine power is transmitted through a new gear drive connected to the Jeep front power takeoff, supplying power to the digging ladder. By this unit the hydraulic pump for the operation of the boom control is driven, and power is also supplied to the hydraulic drive for the trenching speeds. This compact drive being constructed with helical and bevel gears mounted on anti-friction bearings and running in oil, replaces a multitude of sprockets and chains, as well as the Jeep Rear Power Takeoff and the Jeep Belt Pulley Drive." "When trenching, the power for the forward speed of the Jeep-A-Trench Gear-Draulic is supplied through an exclusive hydraulic drive. By adjusting the operating control, speeds are infinitely variable from zero to the fully engaged position. The hydraulic drive oil cushions the shocks when intermittently changing soil conditions are encountered, making for smooth and precisely controlled propulsion under all conditions." Page 2 with most of the text printed here. Page 3 with detailed cutaway illustrations of the mechanical components. Page 4 as seen above with description of more features. Page 5 with several photos of the Jeep-A-Trench in operation. Tremaine Cooper photographed a dually CJ-3B with a Jeep-A-Trench Gear-Draulic (50K JPEG) evidently still in use by Krippners Trenching in New Zealand in 2003. 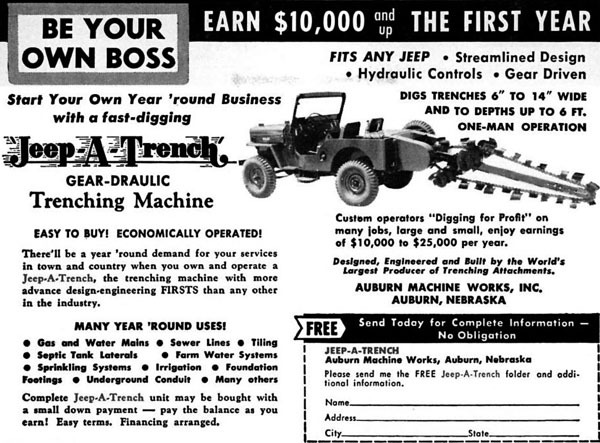 Auburn was innovative in marketing their trencher, as demonstrated by this offer to Jeep owners to turn "any Jeep" into a business. The unit was also available through Willys' Jeep Specialized Vehicles and Equipment catalogue. Auburn Machine Works, established in 1926, was in operation as Auburn Consolidated Industries until 2007 when it went out of business, and was purchased by the Ariens Company, who manufacture lawn mowers and other outdoor equipment at the plant. See John Ittel's Jeep-A-Trench in action at the 2016 Willys Jeep Rally in Ohio. Return to CJ-3B Advertising and Literature on CJ3B.info.